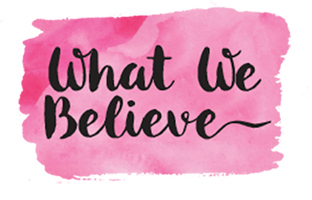 My dear friend Lindsay, shared this clever idea with me! Her sister had made one with an S and when she was explaining it, I just had to make one too! 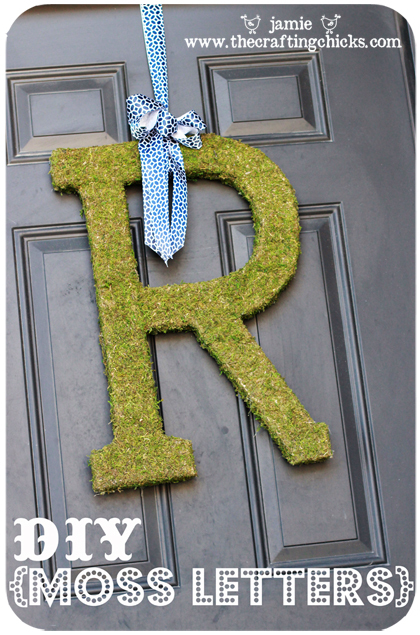 I have seen the moss letters from Pottery Barn…but they are $79! Wow…a bit much I would say. Especially when you can make them for MUCH less! Lindsay and I ordered our Large Paper Mache letters (approx. 24 inches tall) from JoAnn Crafts. You can only find them online. It was really easy to glue on the moss. I only covered the front and sides (since the back is not seen:) It was a bit tricky to cover the insides of my B. The best way to tackle it is in sections. I did the top part of my B and then the bottom part (so one moss sheet for the top and the other moss sheet for the bottom.) I then cut little slits in the moss to fold into the opening of my b and glue it down. 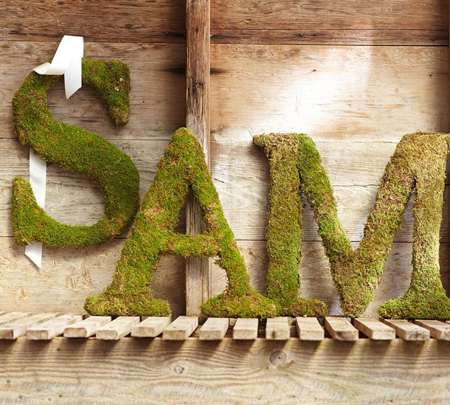 I used the extra moss to fill in any blank spaces. It blends well because of the texture…. Just take your time and it will look great….it is hard to mess up! Now it is ready to hang up! 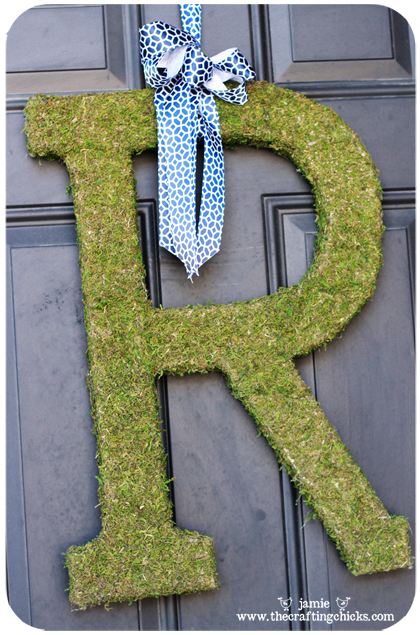 I love the geometric pattern Lindsay found for her R. I love the pop of green from the moss. 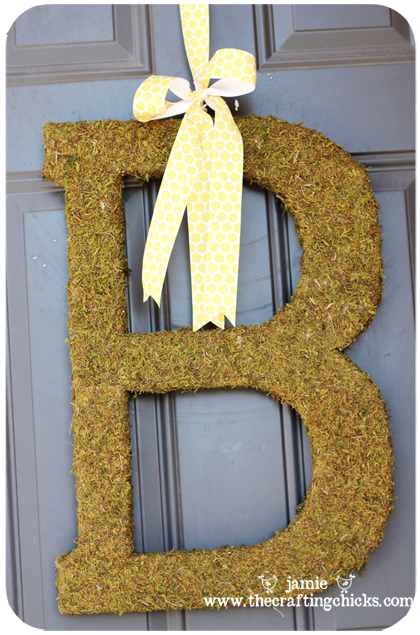 I have some clever ideas to add to my Moss Letter throughout the year…can’t wait to share those ideas as well! 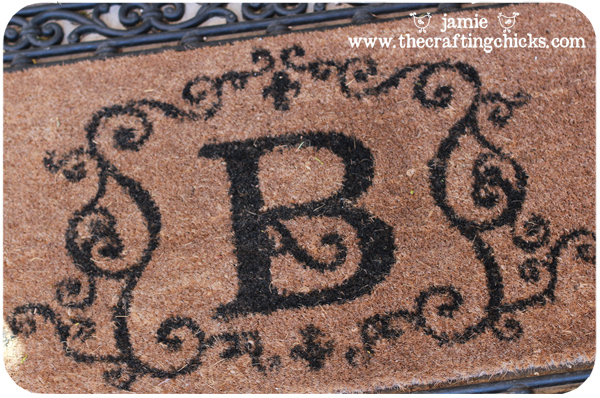 My B goes great with my Monogram mat from Bed, Bath & Beyond! 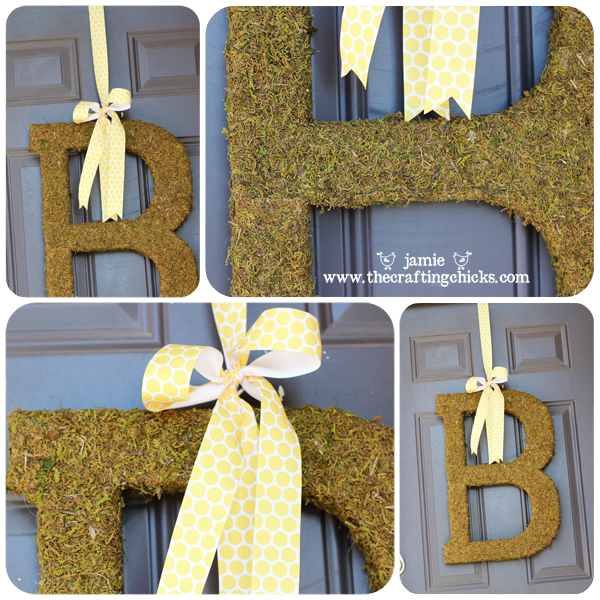 I am excited to spruce up my porch soon and share the ideas I have for that…so stay tuned. Thank you to my dear Lindsay friend for the clever idea! It is so great to have fun friends to share ideas with. I absolutely love this idea. Any idea where I can find a ‘K’? I’ve wanted to make one of these for a long time but I’m scared!!! 🙂 How do you not burn all your fingertips off pressing down the moss? Thanks for the great tip. I went to the Joann’s site and they had free shipping today! Bonus!!! This may be a dumb question but how long does moss like that last?? Awesome! and it was so great meeting you at SNAP! This is awesome! What did you use to hang it?